Al Franken announced today that “in the coming weeks” he will resign his seat in the U.S. Senate. Franken, a Democrat from Minnesota, was the subject of a series of allegations of sexual harassment and improper conduct, and ultimately members of his own party decided it was time for him to go. Why Franken will leave “in the coming weeks” rather than immediately isn’t entirely clear — but apparently part of the Senatorial prerogative is deciding when your resignation will actually take effect. In any case, Franken is one of three members of Congress, both Republican and Democrat, to announce during this week alone that he is resigning in the wake of sexual harassment allegations. When I heard that Franken had finally bowed to the inevitable and decided to resign, I thought about the fact that I saw him on the Bill Maher show only recently, when he was riding high and touting his new book, called Giant of the Senate. I’ve seen the book prominently displayed in the local library during a recent visit before the allegations and the appalling photo first hit the news. Franken being Franken, no doubt the book title was in large part tongue in cheek — but still the juxtaposition of the book title and its cover illustration with Franken’s rapid downfall and humiliating resignation suggests a valuable lesson. Hubris, even partly tongue in cheek hubris, is just begging to be brought low. You can probably buy Franken’s book at a discount these days. Today the Texas Department of State Health Services announced that a preliminary test indicates that an American health care worker has tested positive for Ebola. The worker was involved in treating Thomas Eric Duncan, the West African man who came to the United States after being infected with the Ebola virus and died of the disease last week. 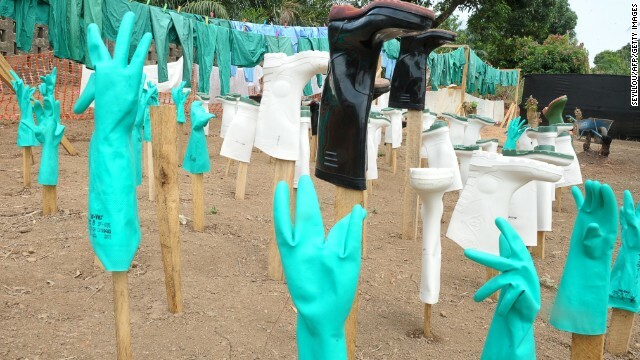 The preliminary results indicating the health care worker has Ebola will be subject to confirmatory testing by the Centers for Disease Control and Prevention. This news of transmission of Ebola in America is troubling in and of itself, but it is especially alarming when coupled with the fact that a Spanish nurse who also was involved in treating an Ebola victim contracted the disease. The Spanish nurse’s infection is attributed to “human error” — her alleged failure to follow strict protocols designed to prevent transmission of the dread disease — but there is no explanation, yet, for why the Texas health care worker may have contracted the disease. Perhaps the Texas health care worker also made a “human error,” or perhaps the world health care authorities don’t know as much about how to prevent the spread of this strain of Ebola as they think they do. Could the CDC, the World Health Organization, and other health care entities have experienced a bit of hubris about their ability to deal with this disease, and could we now be learning that they were overconfident about their understanding of Ebola and how it is transmitted? Even if the new cases are due entirely to “human error,” the fact that treatment protocols are so challenging that trained health care workers can fail to comply with them should give us all pause. We’ve all heard about epidemic scenarios — read Stephen King’s The Stand if you want a realistic and chilling depiction of what might happen if the genie of a highly contagious disease gets out of the containment bottle — and Ebola seems like exactly the kind of devastating disease that could cause such nightmares to come true. The fact that health care workers are being infected should cause us to redouble our efforts to prevent people who might be infected from entering the country in the first place, and to dramatically increase the precautions taken when we identify a person stricken with the disease. No doubt we will be getting assurances from the federal government and the CDC that the situation is well under control. Given what is happening, I’m not quite ready to credit those assurances just yet. Let’s see some actual positive results first. This morning I cursed inwardly when, for the thousandth time, Kasey and Penny got tangled and we had to stop our walk and sort things out. A few moments later I grumbled again when an undetected jogger startled me by announcing her presence when she was right behind me and ready to pass by. Then my thoughts wandered to what’s happening in Syria and other troubled places, and I thought: I’m lucky to live where I can take my dogs for a quiet walk in the pre-dawn hours without risking life and limb. The walls in our town aren’t riddled with bullet holes. I don’t see syringes or broken crack pipes on the doorstep when I walk outside. I don’t hear gunshots or the sound of fistfights when darkness falls. My friends and family members haven’t been blown to bits by suicide bombers. Armed gangs don’t roam my neighborhood. And I don’t have to worry about jackbooted soldiers kicking in our door or destroying our house with shelling. When I hurt my back a few weeks ago and every sudden movement was intensely painful, I realized as I had never realized before how wonderful it is to be able to move without pain. It’s one of those things, perhaps, that you cannot fully appreciate until it’s gone and you understand how awful the alternative can be. Personal security, I think, falls into the same category. If you are safe and snug in your tidy neighborhood, it’s hard to fathom what it must be like to have to worry constantly about the smallest things and then try to earn a living or function as a family. I imagine the people in the war-torn parts of the world would give just about anything for a chance to take a peaceful walk with dogs.